Moral issues within psychology have been an object of study since the 1890s (see, for example, Hall, 1891). The majority of studies in the 20th century have centered on themes of justice, not mercy (see, for example, Killen & Smetana, 2006). In the 1980s, almost a century after the emergence of moral psychology, the construct of forgiveness began to emerge as a possible area of basic and applied research within psychology. From its humble beginnings, the psychology of forgiveness has now begun to emerge as a field worthy of researchers’ time. For example, in 1985 a perusal of the American Psychological Association’s data base yielded no entries for the word “forgiveness.” An examination of that site (PsychINFO) in October, 2006 revealed a total of 218 entries for 2005-06 alone. Those entries are as wide ranging as social, developmental, clinical, and counseling psychology, family studies, and psychiatry. Forgiveness is even making inroads into the study of law (Sullivan & Tifft, 2006) and peace studies (Bole, Christiansen,& Henemeyer, 2004). 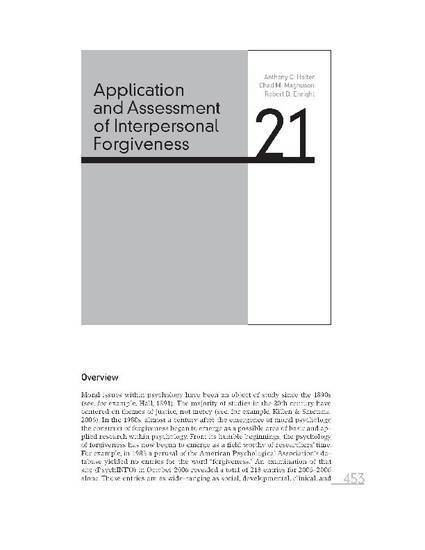 This chapter discusses the research and practice in interpersonal forgiveness applied to the health professions.